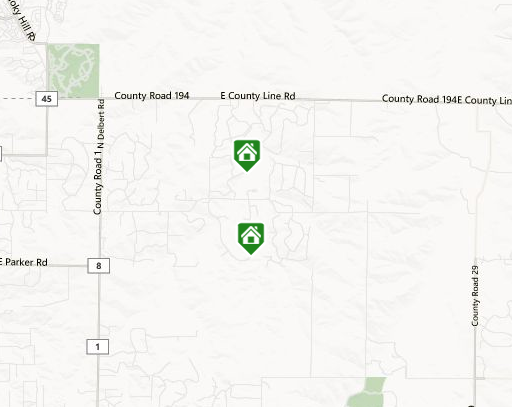 Elkhorn Ranch is located South of E. County Line Road and East of Delbert Road and homeowners enjoy 5 acre lots. Lennar is returning to Elkhorn Ranch offering 5 acre lots for homes to be built by Lennar or by a custom builder. You will find ranch and two story homes with 2,178 square feet to 4,112 including finished basements. Homes have 3-6 bedrooms and 3+ car garages. Some homes have outbuildings for additional car storage. Homes average $487,329 and are on the market for an average of 125 days. (March 2014) Homes were built in Elkhorn Ranch 2005 through 2013. You will see some new homes being built in the next few years. School age children will attend schools in the acclaimed Douglas County School District.